In 1925, the right to teach evolution went on trial in Dayton, Tennessee. This trial was broadcast nationally on radio and covered by two hundred newspaper reporters. John Scopes was a 24-year-old high school biology teacher accused of violating the Butler Act (1925), a law that prohibited teachers in any Tennessee-funded public school and university from denying the Biblical account of man’s origin, thereby making the teaching of evolution unlawful. Scopes used the textbook Civic Biology, which described and was sympathetic to evolution; however, it is unclear whether he actually taught such a lesson or merely admitted doing so to publicize the issues in the case. The American Civil Liberties Union supported Scopes in defense of the constitutional right of free speech, as well as his academic freedom. Representing Scopes was Clarence Darrow, a nationally acclaimed defense attorney, a leading member of the ACLU, and a self-proclaimed agnostic. On the prosecution team was William Jennings Bryan, a three-time presidential candidate, known for his oratorical skills and fundamentalist beliefs. Bryan was fiercely opposed to evolution and its teaching because it contradicted the word of God, as revealed in the Bible, which he believed superseded human knowledge. The judge instructed the jury not to consider the merits of evolution but only whether Scopes had violated the law. The outcome of the eight-day trial was preordained, and the jury reached its decision after only nine minutes of deliberation. Scopes was found guilty as charged and was fined $100. The guilty verdict was reversed on appeal, not because it violated the right of free speech as the ACLU had argued, but rather on a subtle technicality. Bryan died in his sleep five days after the trial’s end; Scopes went to graduate school and became a geologist studying oil reserves. A highly fictionalized account of the trial was portrayed in Lawrence and Lee’s Inherit the Wind (1955), and the Butler Act was repealed over forty years later in 1967. Nine decades after the trial, the subject of faith versus science and creationism versus evolution continues. For many, the jury is still out. 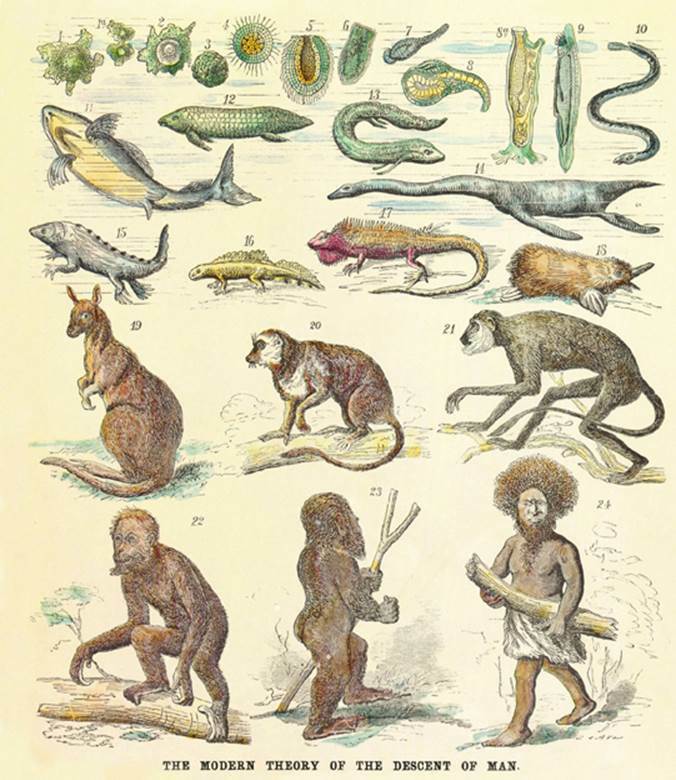 The human pedigree, as envisioned by Ernst Haeckel in his 1874 work The Evolution of Man. Evolution is more accurately illustrated with a phylogenetic tree, rather than this modified “Great Chain of Being” that links the prosimian (lemurs, etc.) directly to the kangaroo.